Bajjis, that brings life and makes any evening special is one of my favorite coffee or tea time snack. I have lot of memories associated with the Bajjis. MIrchi Bajjis with friends at college. at times with family when Amma made them at home or during the ‘Penn Paarkum Padalam’ of my cousins where it was a custom to serve Kesari & Bhajji. Onion bajji is Appa`s favorite, Vazhaikkai bajji is my husband`s and bread bajji is my daughter`s. My all time favorite is Mirchi/ Milagai Bajji. 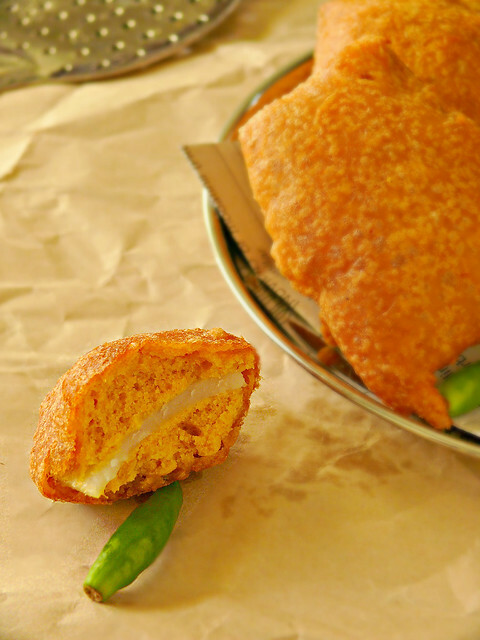 Usually the name of the vegetable that is deep fried is suffixed with bajji. 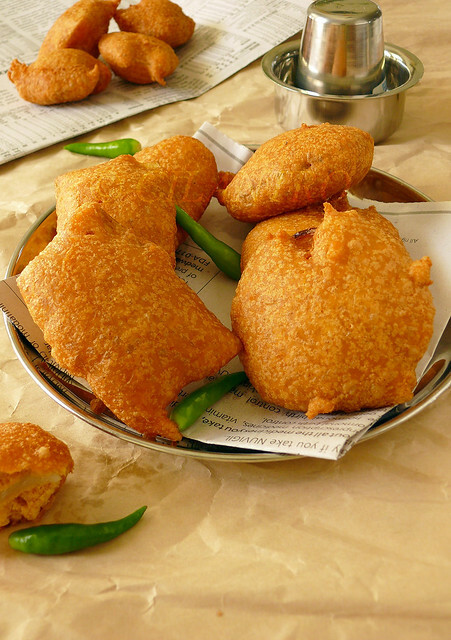 For example sliced potato wrapped in batter and deep fried is potato bajji similarly onion bajji or Mirchi baji . Bajji kadai is synonymous with the beaches in Chennai. They are served in a push-cart with some loud film music playing and the bajji comes served in a plate with banana-leaf or a newspaper. There are numerous Bajji stalls elsewhere in the city too. Along with Bajjis other savories like pakoda and bhonda are also sold here. The picture below taken at Yercaud,TN depicts a typical Bajji stall on the road side. Dallas is experiencing pleasant weather with cool breeze and its nice to have hot bajji with a cup of hot coffee. 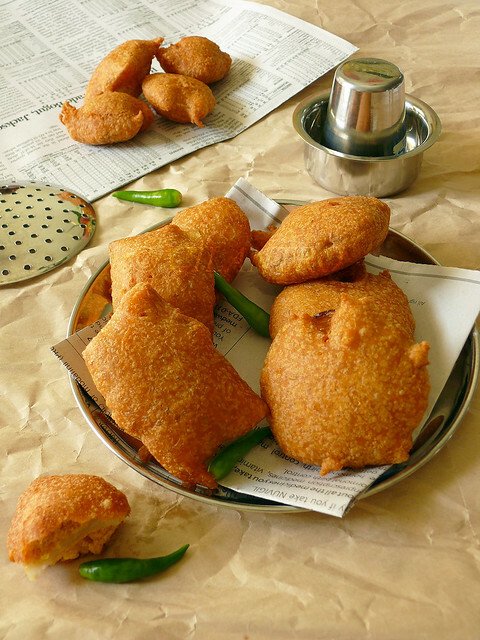 Handful of flours and few vegetables of your choice is all that is needed to make these deep fried bajjis. Raw plantain, potato, cauliflower,brinjal, onion, bread are the vegetables used typically. I have also had pineapple, ridge gourd and fish bajji. Combine all the flours with rest of the ingredients except the vegetables and oil. Add the water and mix well to form a smooth thick batter. (make sure to have a thick batter, a thin batter will absorb more oil ). Heat oil in a deep frying kadai/pan. Dip each slice of vegetable into the batter so that it coats well and place in the hot oil slowly. Reduce heat to medium and deep fry till they turn golden brown. Use a slotted spoon to turn them so that it cooks on both sides. Once they turn golden brown, remove them on to absorbent paper. Serve as evening snack with coffee or tea. 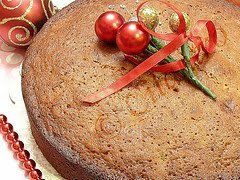 TIPS: I have used maida in the recipe and its optional. Red chilli powder can be reduced if you like it less spicy. I used a mandolin to slice the vegetables. It has to be a little ticker than slices for chips. The left over vegetables and onions can be roughly chopped and mixed with left over batter if any and made as pakodas. Serve with coconut chutney or ketchup. BAJJI MIX: Mix besan/kadalai mavvu/chickpea flour, rice flour, maida, red chilli powder, asafoetida, baking soda/soda bi carb and salt for further use. use the double the quantity given and store in airtight container in a refrigerator for freshness. Add water and idli batter while making the Bajjis. Hope u'll drop by my space n follow it too..
Looks perfect for the cold and windy weather here. S comforting. Perfect and delicious bajji.. nice clicks too !! 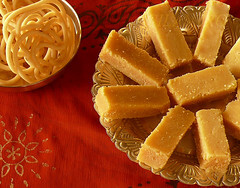 Wonderful pictures, feel like grabbing some out of the screen.Bhajji's are my all time favorite snack. wow! !wonderful post...bhajji looks yummy! with tea semme combo! love the phots looks delicious. OMG.. super tempting pics! adding idli batter is new to me.. will try this way! just looking at eat makes me feel hungry! Very appetizing and brings back lots of memories of the beach visit. Wish i could grab all of it. Happy to follow your lovely space. Hi!!! I have left an award for you. Please collect at my blog. This looks like something that would be really fun to make. So, I will give it a try over the next few days for me and my hubby. Super tempting bajji!looks so yummy. I love bajji too. What brand mandolin you have? I am looking to buy one. Appreciate your reply. I have the `Good Cook` Mandolin that I bought at an outlet store for $6. There are more expensive ones available but this works great for me. First time here,what an amazing clicks and wonderful crispy Bajjis looks delicious!